Ancient wisdom passed down through generations has given us timeless practical philosophies for maintaining a healthy and peaceful life. At present, India has many health care systems which have a holistic approach towards treating health ailments. They provide welcome relief to people tired of medicines which provide symptomatic remedies rather than a permanent cure. To counteract the stresses of modern life and to achieve health and fulfillment without frequent recourse to strong medications, more and more people are turning to mother nature. "A healthy body in a healthy mind" is the doctrine followed by nature cure in Rajasthan. The Natural Law of healing prescribes solutions which are derived completely from nature and are free from any harmful side-effects. There are four prevailing systems of health-care in India, besides Allopathy or the modern western system; Homepathy, Ayurveda, Unani, and Nature Cure. The first three are concerned primarily with curing illness rather than with preventing it, but the nature cure system does not requires drugs, it relies on an intelligent use of the means provided by nature itself. Ayurveda is a medical-metaphysical healing science. It helps a healthy person to maintain health and a diseased person to regain health. Siddha medicine which is made from herbs, minerals and animal projects is based on the belief that all diseases are caused by an imbalance in "humuors" (fluids) in the human body. Siddha has also developed a discpline called Kaya Kalpa for longevity and freedom from illness. Homeopathy prescribes simple, balanced and easily adnistered medicines which are derived from nature. The unani system is practiced by hakims and vaids in rural as well as urban parts of the country. The Yoga philosophy is another dimension of nature cure. Yoga has powers to claim the mind, relieve stress and tension and stimulate blood circulation and overall health. The Yoga postures and their variants work on all the body systems. They are also helpful in toning the muscles and strenghthening the internal organs. 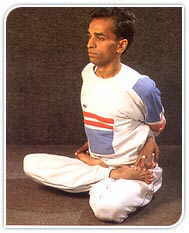 There are special postures recommended to offer relief from problems such as headaches and hypertension. The asanas the pranayama, of yaga can be practised by people of all ages with the help of an experienced instructor and once the techniques are mastered, the benefits are not merely physical but also metaphysical. Yoga helps in becoming conscious of the calm and higher source of strength which resides deep within all of us. Today physiotherapy and exercise schools in the west are adapting movements from yoga postures because of their wide applicability and therapeutic uses. Come to Rajasthan and discover the inner strength within you, because the solution to all our problems lies within us and nature which surrounds us. Rajasthan, like other states of India, also has a vast network of traditional health care institutions. Not only in the government sector but also in the private sector, the practice of healing through naturopathy and alternate therapies is still practiced. Despite the impact of modern medicine, Rajasthan still preserves and promotes its traditional health-care system based on naturopathy and the Vedic approach to health. In ancient days, each state had a separate department of medical facilities headed by a "Raj Vaida" and also patronized indigenous health care systems. through Vyayamshala (gymnasium), wrestling, weight lifting and Arogyashala. The rulers and landlords often donated land to establish an Arogyashala or Ashram within their respective areas. Apart from this, the rich trading communities also built many Chiktasalya (dispensaries) which were attached either with temple management or a trust of their caste. The work of health care was treated as a form of charity. Today, a number of nature cure and yoga centres are spread all over Rajasthan. They not only offer a perfect system of health care and diagnostic methods but also facilities of steam bath, mud bath, rigorous dieting and physical exercises. Patients have been coming for treatment to these centres from all over the country and even from as far as Britain, U.S.A., Australia and Europe.